Where were record temperatures observed on 1 July 2015? 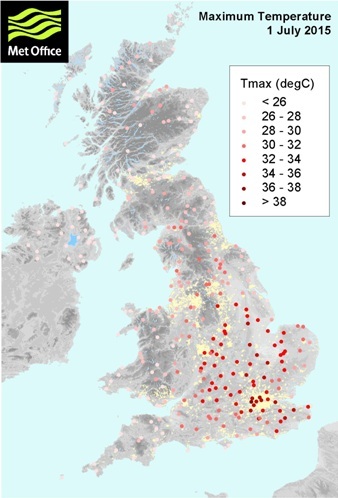 Although Heathrow measured the highest temperature recorded by the Met Office observing network on a July day, record temperatures were reported across a wide stretch of the country, including from some of the Met Office’s very long running climate stations. Temperatures exceeded 35 °C at a handful of locations in London and the south east, but also reached the low 30s across the Midlands, East Anglia and parts of north-west and north-east England. It is in these areas that July temperature records were broken. How does this compare to past heatwaves? Temperatures over 36 °C reported at any station in the UK observing network are very rare, with only a handful of notable heatwaves seeing such extremes. The heatwaves of August 1990, August 2003, and July 2006 each saw a number of stations exceed 36 °C, whereas on 1 July 2015 Heathrow was the only station. The Met Office maintains a list of climate extremes for the UK. It is standard practice to report the highest and lowest temperature every month as part of our routine monitoring of UK weather and climate. It is therefore always noteworthy when one of these records is broken. While there is no doubt that some previous heatwaves have seen more extreme or more widespread high temperatures overall – particularly in the climatologically warmer period from late July into early August – 1 July 2015 has the honour of holding the highest recorded temperature for a July day with 36.7 °C at Heathrow. How do you ensure the data are reliable? To ensure consistency, Met Office weather records are only given for stations with standard instruments and exposure. This means that our records would not represent the extremes that may have occurred in places where we do not have standard instruments. This may have been the case on 1 July 2015, where the availability of additional data from amateur observers contributing to Met Office WOW show peak temperatures in the range 35 to 37 °C to the west London. It is reasonable to ask whether Heathrow, as a major international airport, can provide a reliable climatological record. Are the observations biased by the presence of runways and air traffic? The instrumentation and station enclosure are managed so that they meet the standards required by the Met Office and set out by the World Meteorological Organization. The site has been operating for 66 years and provides an excellent long observational series for west London. 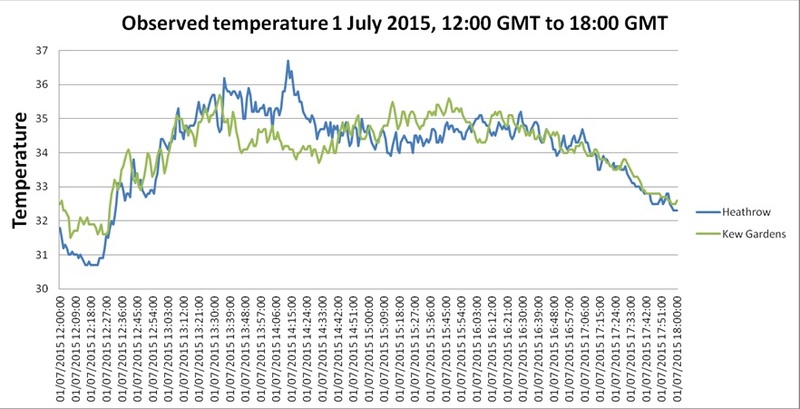 On 1 July the maximum temperature recorded at Heathrow (36.7 °C) was higher than Kew (35.7 °C). Modern instrumentation means we can look at the temperatures minute-by-minute at the two sites, as shown below. The two locations recorded very similar temperatures through most of the afternoon and the average temperature at the two sites between 12:00 and 18:00 GMT agree to within 0.02 °C. However, there was a peak in temperature at Heathrow between 14:00 and 14:30 GMT that was not seen at Kew Gardens. What could cause such a peak? There were scattered clouds in the area that afternoon. 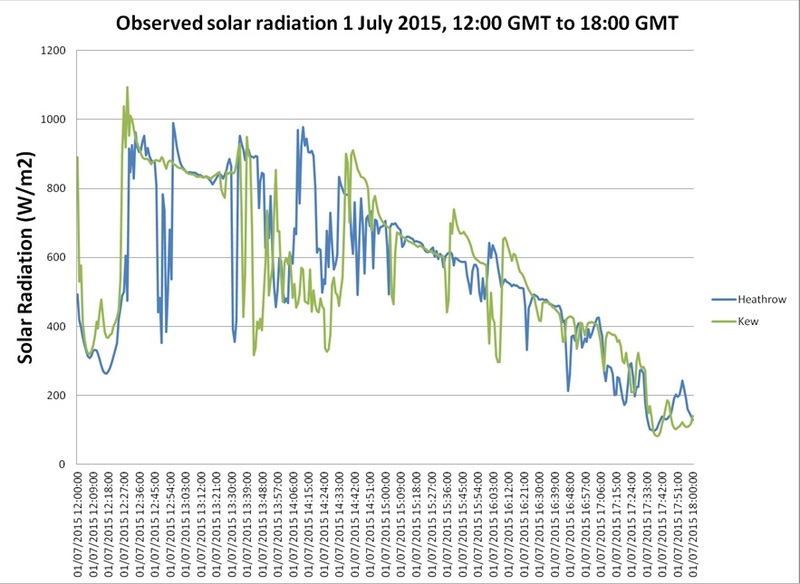 Both Heathrow and Kew Gardens have instruments measuring solar radiation, shown in the graph below. Both sites recorded a general dip in solar radiation due to clouds from approximately 13:30 to 15:00 GMT which corresponds to a slight cooling at both sites. Heathrow saw a short gap in the clouds shortly after 14:00 GMT which resulted in a similarly short lived peak in temperature, while Kew Gardens remained cloudy. In turn Kew Gardens then saw a brief spell being sunnier than Heathrow just before 15:00 GMT and became warmer than Heathrow for about an hour. 1) It totally fails to address the issue of how you can compare Heathrow with Wisley, where the previous July record was set. The fact that Heathrow has “standard instruments” is neither here nor there. On the contrary, it highlights the concern that airport temperature stations were never set up to be used for climatological purposes, and their preponderance globally is skewing temperature trends. Put another way, would the Met Office like to estimate how much Heathrow’s temperatures are artificially inflated by the proximity of tarmac and jet engines. They go on to say the Heathrow has been operating for 66 years, providing a “long observational series”. Are they not aware that 66 years ago Heathrow was not the major international airport it is today, and that such “long observational series” are not reliable climatologically? 2) Despite all of the July records listed, I have advance information that the CET for 1st July was well below the record high set on 3rd July 1976, and subsequently tied on 3rd August 1990. Certainly some parts of the country may have seen record highs for July, but clearly much of the country did not. I still await a proper analysis from the Met Office which puts last week into proper perspective. 3) There is much talk of “July” records, but little mention of August 1990, when the heatwave was considerably more intense and widespread. Indeed the 1990 event affected virtually all of the UK, unlike last week’s which only really reached the south and east of England. Climatologically, July is a warmer month than August in the UK, and there is no reason why heatwaves should be hotter in August. Indeed, their statement in the climatologically warmer period from late July into early August is highly misleading, because the CET shows temperatures dipping away by the end of July. In any event, as we have seen, the record high CET in 1976 was on 3rd July. Whether a heatwave hits on 3rd or 13th of July has no significance climatically, it is purely a random weather event. 4) They show a handful of July record temperatures, but this is only meaningful if they show this as a proportion of the total, in other words – how many stations did not set records. And again, how do these compare with August records? 5) The chart for Heathrow in comparison with Kew is interesting, but again raises more questions than it answers. For instance, we have three readings from Ruislip, only seven miles away from Heathrow, within a few minutes of the spike at the airport. All three readings are the same at 35.0C. It is also noticeable that when the sun “came out” at Kew about half an hour after it did at Heathrow, temperatures rose by about a degree, and not the two degrees that was measured at Heathrow. The question of whether this spike at Heathrow was at least in part caused by a small windshift, bringing air from the runway, certainly does not go away. Isn’t it now time that they published a full analysis to show the whole story, and not just the parts they want us to see? Their table accompanying the map clearly shows that Heathrow has a UHI problem on the order of 2-3C. Paul, you and Booker hit a nerve, and the responders were not smart enough to think their reply through completely. How nice of their own reply to show the misleading impression Heathrow gives. As a general rule of thumb, if you make a forecast and say you are very certain you are right, and you then get it wrong – and worse won’t admit that it is wrong. Then it’s going to take a very very long time getting the forecast right before anyone can trust you again. No one forced the Met Office to jump on the global warming propaganda bandwagon. And given the time it takes to test climate forecasts, I really can’t see the Met Office having any credibility on the subject in my lifetime. The instrumentation and station enclosure are managed so that they meet the standards required by the Met Office and set out by the World Meteorological Organization. Which says a lot about Met Office standards. In the good old days, Stevenson screens were designed to avoid direct sunlight affecting the temperature reading. One assumes that when the sun comes out, it heats the ground, which will then heat the air above it. The Heathrow tarmac & concrete will heat up more than the grass at Kew? That spike cries “artefact” to me. If those had been lab readings, the instrument would be checked or even recalibrated, the apparatus checked, and the experiment repeated. If they had been observations on industrial plant, where repetition is not usually possible, the spike would probably have been dismissed as an error, with a note added to file to check the instrument at the next plant shut-down. And if the Met Office were dedicated to science, it would probably have published the data, with an asterisk saying that they suspected the peak to be an artefact and were investigating its cause. If you study the attached graphs you will see that the UKMO explanation for the peak at Heathrow does not stack up. The sun came out at Heathrow from 1406 until about 1419. The Heathrow temperature rose at 1406 but was dropping like a brick 5 minutes later, some 8 minutes before the sun went in. Let’s see if they can explain that little difficulty. I think you got this right but for a different reason. The weather station is aligned with an exit lane from the North runway in a SE dircetion. The wind direction helped blow jet exhausts onto the Stephensen screen. Between 14:00 and 14:30 at least 3 large Jumbo jets including a 380 landed and exited from that lane. This is the most likely cause for the temperature spike. Is it that they knew they would need dodgy airport and inner city weather stations to actually create some warming?